Today our compass took us west. I-10 was our route of convenience and our desire for Corps of Engineer Campgrounds led us to Lake Seminole just a tad outside Florida into Georgia. We traveled state routes 116/113/115 from Mayport to Jacksonville and got onto I-10 at it's very beginning in downtown Jacksonville. Downtown Jacksonville with the Cougar in tow was not a fun time – possibly a little easier because it was Saturday. We traveled the 227 miles in six hours and forty-five minutes. Lake Seminole has some interesting geopolitical trivia associated with it which could be very confusing if you are a fisherman. Lake Seminole is a reservoir located in the southwest corner of Georgia along its border with Florida, maintained by the U.S. Army Corps of Engineers. The lake is fed from the north by two rivers. From the northeast, the Flint River flows southwest through Bainbridge, GA. From the northwest, the Chattahoochee River provides the second source and forms the border between Georgia and Alabama. Lake Seminole extends upstream along the Chattahoochee River for 30 miles and up the Flint River for 35 miles. 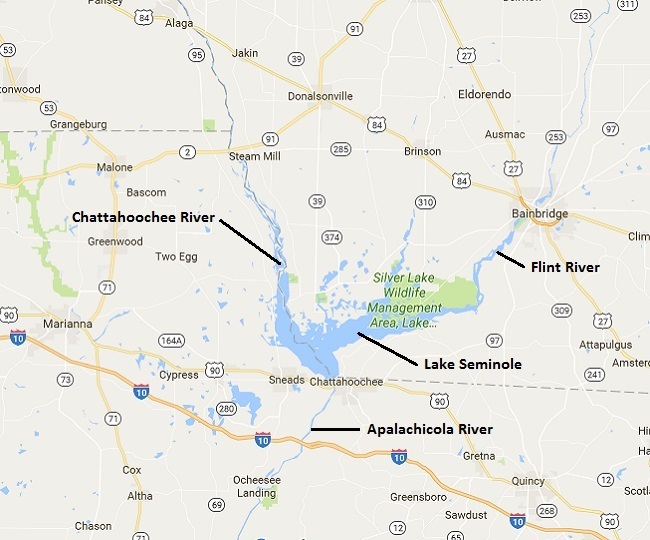 The Apalachicola River runs south from the dam to the Gulf of Mexico, cutting the Florida panhandle in two as it is the boundary between the eastern and central time zones. So a person within a very small circle around the dam could be in either of two states and either of two time zones. Commuting to work could be confusing. The lake, impounded by the Jim Woodruff Lock and Dam, contains 37,500 acres of water and has 376 miles of shoreline. Flowing out of the lake and heading south, the water becomes the Apalachicola River. The dam crosses the state line between Georgia and Florida, with the eastern end of the dam being located in Georgia. The dam is effectively the FL/GA border. The Jim Woodruff Dam, located about 1,000 feet south of the original confluence of the Chattahoochee River, Flint River and Spring Creek to form the Apalachicola River and with a spillway 2,224 feet wide, is a hydroelectric and navigational dam named in honor of James W. Woodruff, Sr., a Georgia businessman who spearheaded the development of the Apalachicola-Chattahoochee-Flint Project. 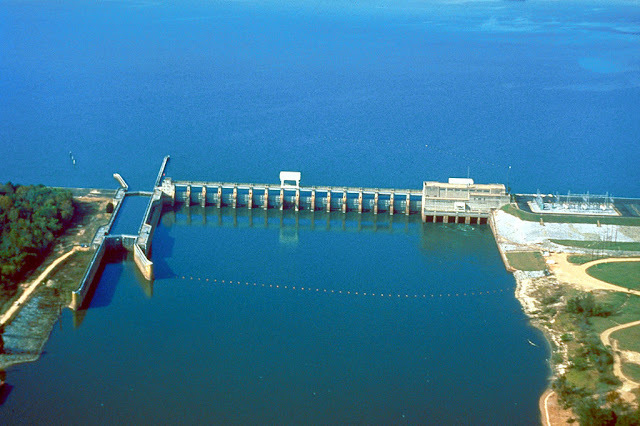 The dam has a single lock, 450 feet in length and 82 feet wide, that provides navigational access to the lake and the upstream rivers from the Apalachicola River and the Gulf of Mexico. Aptly named, Eastbank Campground is located on the eastern shore of the lake with 65 campsites, most of which have both electric and water hookups. Flush toilets, showers, drinking water, laundry facilities and a dump station are provided. Today was a different kind of day for us. We didn't do any tourist things. We drove into Jacksonville to have lunch with Dan Bessman. Dan was our son Adam's college roommate for four years at the US Naval Academy, then Best Man at his wedding. Dan stayed in the Navy and is currently stationed at Jacksonville Naval Air Station. We haven't seen him since their fifteen-year reunion three years ago. We had lunch at the Maple Street Biscuit Company. That is a new location for us. The menu was different and the food was good. It was good to catch up on his family and his Navy career. Both are doing well. Dan is at the eighteen-year decision point which every career military officer faces. I remember it well. He is the proud father of three lovely daughters and his eyes light up when he talks about them. Well done Daniel. Lions and Tigers, No Bears, Oh My! Catty Shack Ranch is an all volunteer organization. 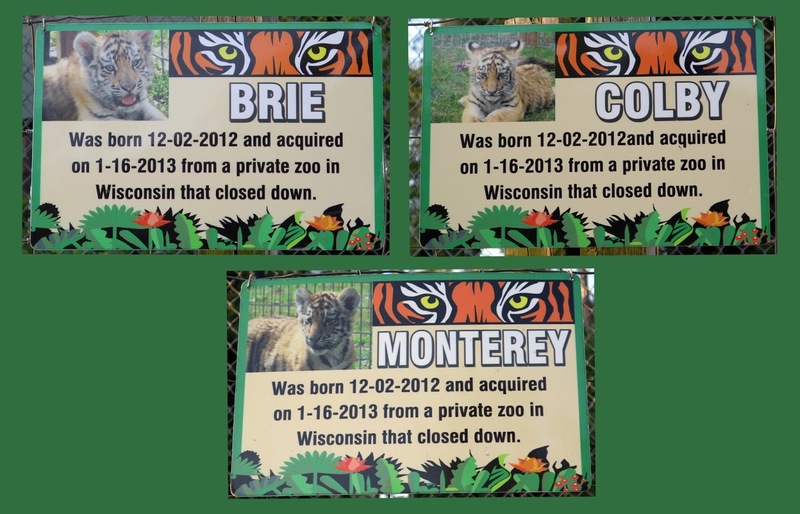 The animals are all rescued from other organizations. 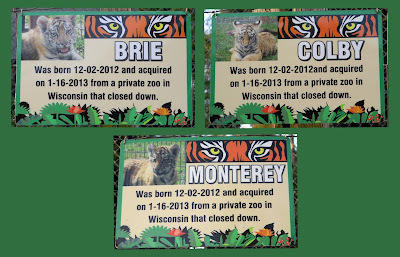 None are taken from the wild. An interesting fact is that there are now more tigers in captivity that living in the wild. They keep somewhat unusual hours, dictated by feeding time for the cats and availability of volunteers. If this post motivates you to visit, be sure to check their website for hours. We visited during the evening tour and feeding (6 PM to 8 PM). During out visit, I took 152 pictures, so I decided to try something new with this post. I am going to put the photos in an album in Google Photos. I have included just a few pictures here. Then I am going to try to link this post to the album in Google Photos. I have no idea how it will work out. I would appreciate hearing from you about the success or failure of the experiment. That's enough. 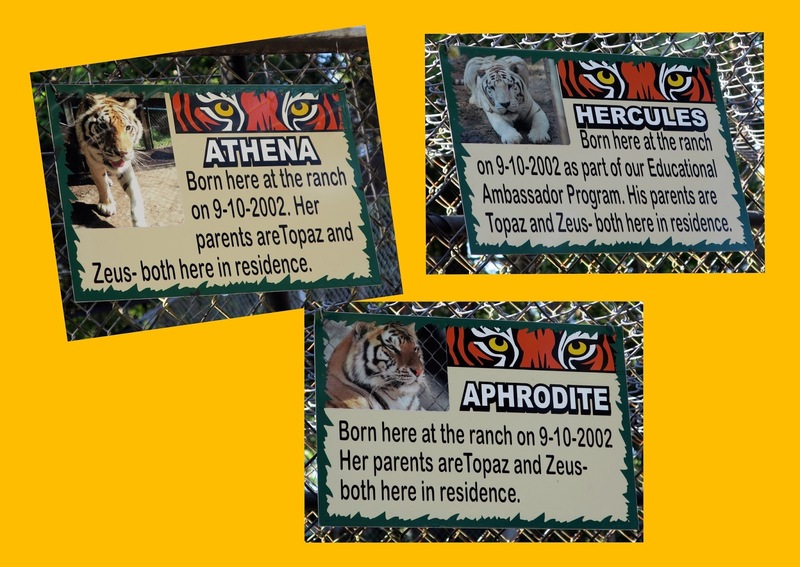 There are many more big cats and other critters at this sanctuary. 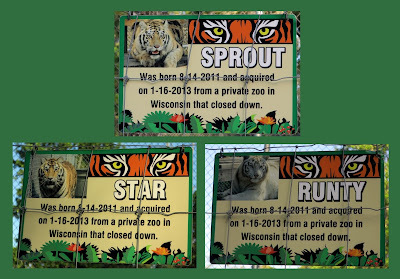 See them yourself or check out the Catty Shack Ranch Wildlife Sanctuary website. Today we played tourist and explored the area close to our home base at Osprey Cove. Our first discovery was that this area is severely complicated by the St Johns River Delta. I don't know if it is officially a delta, but it looks like what I think a delta should be. Tidal marshes and waterways that change shape twice a day with the rising and ebbing tide. 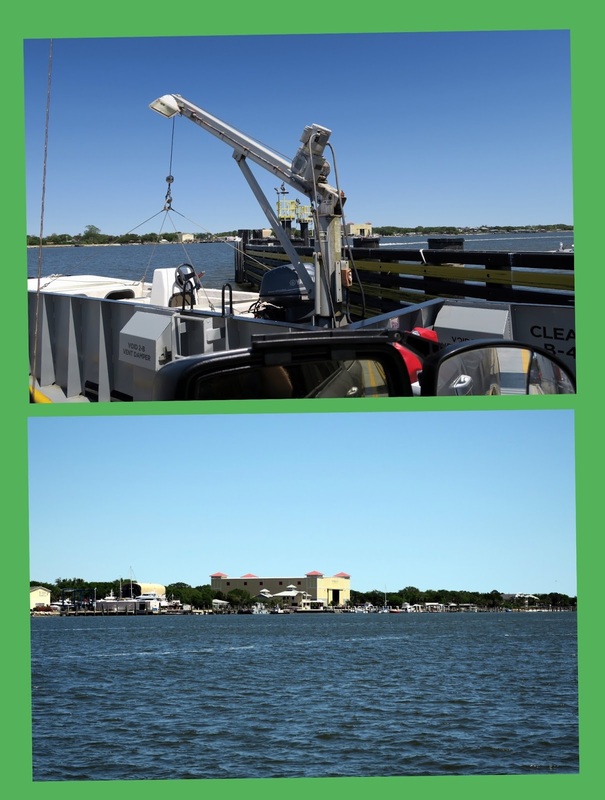 Mayport has a small town look about it and it is hard to believe that it is dominated by the US Naval Station and the major seaport city of Jacksonville just a short distance upstream. The town has been around for a very long time -- established May 1, 1562 -- 455 years yesterday. Happy Birthday Mayport. Those of us who live on the Atlantic coast of Florida are familiar with State Route A1A as the beach route that runs along most of the coast. Today I learned that A1A includes a Ferry across the St. Johns River. In fact A1A is part of the Ferry's name. I also noted that there is no apostrophe in Johns. One way passage across the river is $6 for autos and trucks. The ride is short but the driving alternative is very long. So $6 is a bargain. Come to think about it, that's the purpose of any ferry. Duh! The area on the north side of the river is known as Fort George Island. 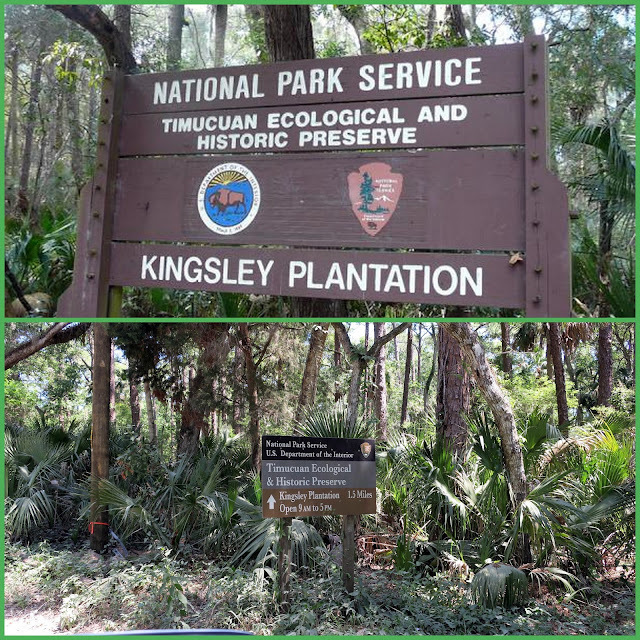 Route A1A continues north and a long narrow, winding, rutted dirt road took us to the Kingsley Plantation. 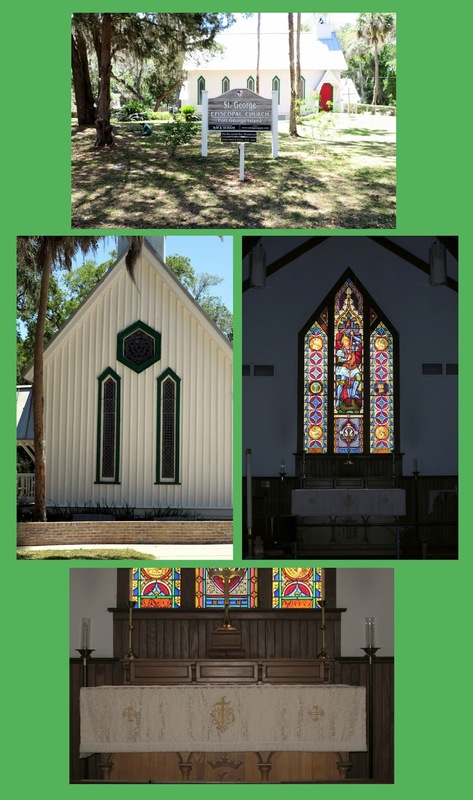 is part of the National Park Service's Timucuan Ecological and Historical Preserve. The products from this plantation were Indigo and Sea Isle Cotton, but the story is the same as all others -- opulent lifestyle for a few made possible by grinding poverty and misery for many. I'm not going to repeat that classic tale here. However, Anna Kingsley appears to be the unique twist in this story. The central figure of the plantation was Anna Madgigine Jai Kingsley, African wife of the English plantation owner, Zephaniah Kingsley, who had settled in Spanish Florida in 1803 and became a successful merchant and planter. He purchased Anna as a slave in Cuba in 1806 when she was a teenager and freed her and their children in 1811. 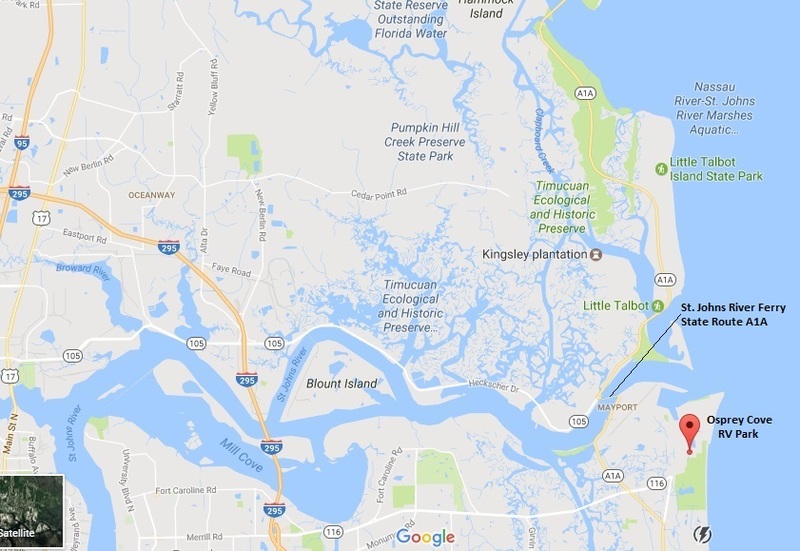 In 1814 the Kingsley family moved to Fort George Island, and Anna became her husband's business partner. For those who want to dig deeper, the story of Anna, Zephaniah, and the plantation are easily found on Google. 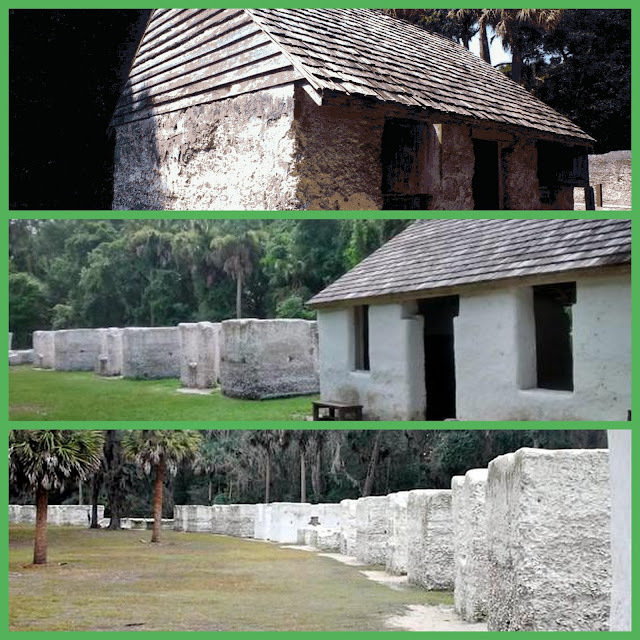 The slave quarters' thick walls were made of 'tabby', a concoction of oyster shells mixed with sand, and they've outlasted decades of humidity and hurricanes to survive from about 1814. Leaving the plantation and heading back to the ferry, we came across the St George Episcopal Church. We had to stop and take some pictures. The church secretary saw us and came out to host us on a short impromptu tour of the building and grounds. ... and she was kind enough to take our picture to prove we were there. A return trip on the ferry put us back in Mayport on the south side of the river, by now very hungry. Singleton's Seafood Shack was our target for solving that problem. As we approached, we exchanged greetings with this cute couple. They applauded the food and encouraged us to try the 'colon cleaner'. Singleton's menu was to die for. I settled on an Oyster Po' Boy and Michelle tried the Crab Cakes. Both delicious. We sampled it "Whew!". Michelle bought a bottle for Adam. I'm not sure when we'll be able to give it to him or if we'll remember it and be able to find it when the opportunity comes. Fed and comfortable we headed back to our rig at Osprey Cove, where I found another shakedown surprise. The bathroom vent fan is not working. I can't tell whether the motor, switch, or both is faulty. I'll deal with that tomorrow. We had a good day. This is what RVing is supposed to be all about. Faulty fan is a minor inconvenience. I'll fix that. Departure day finally arrived. We've spent the last week shutting down the house and getting the Cougar ready to travel. "What's the big deal? You've done this before. ", you say. Yes, we have. But it has been two years, the house we are leaving is different, and our worldly possessions have changed -- both in the house and in the Cougar. The Cougar has aged just sitting for over a year, and I found several problems resulting from inactivity that needed to be fixed. Finally, our mode of travel will be different this year than in the past. This year our stops will be one week, not three months. That alone made me reconsider taking many items. We got it all done -- except what we forgot -- and we rolled out at 9:30 AM. I've been planning this trip for over two years and I thought everyone was familiar with what we are doing. Those who follow the blog may not be, so let me synopsize what we are up to. Our trip focuses on the "The Great River Road" which is the scenic byway running the length of the Mississippi River. We plan to follow it from New Orleans, LA to Lake Itasca, MN. I laid out the trip in roughly 150-mile increments with a seven day stop at each place. Considering a 75-mile radius around each stop, lets me visit every interesting location along the river. There are two other parts of the trip. First getting from Titusville to New Orleans, then getting from Minnesota back to Titusville. I'm working on those legs. 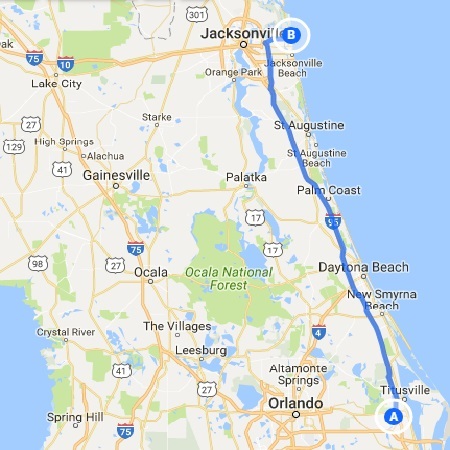 Today we traveled to Jacksonville, FL, just 149 miles and three and a half hours. We pulled into our first stop, Osprey Cove RV Park, at 1:00 PM. The US Naval Station-Mayport has two RV parks for military travelers – Pelican Roost and Osprey Cove. They are close together and operated out of the same office. Today was really hot, so getting the Cougar set up and the A/C running had top priority. Thank goodness things went smoothly and uneventful. With that finished, we went to the office at Pelican Roost to register, which gave us a chance to look the place over. 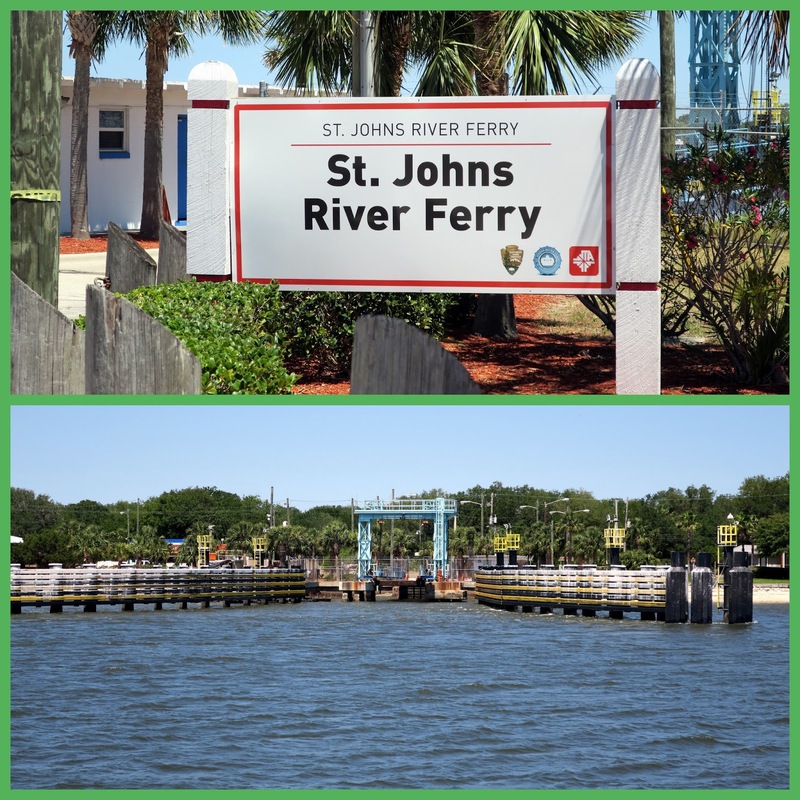 This naval station is right at the mouth of the St Johns River. Our brief drive around the station revealed an aircraft carrier and several smaller ships (destroyers, I think) docked here. For dinner, we found a Thai restaurant in a nearby shopping center, had a nice meal, then turned in early. It felt good to be sleeping in the Cougar again.